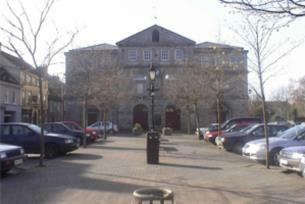 The Athy Heritage Centre and Museum traces the colourful history of the town of Athy in County Kildare. By exploring the local perspective on larger historical events the centre gives an insight into the heritage of the town. The Athy Heritage Centre and Museum in County Kildare is a valuable resource and tourist attraction for visitors interested in discovering more about local Irish history. Through historical artefacts, graphic panels, photographs, and multilingual exhibits, the centre explores the history of Athy against the backdrop other major international events. Located in an early 18th century town hall, the Athy Heritage Centre and Museum shows audiovisual presentations that bring the past to life, in a large room with a capacity for 30. Follow the exploits of the famous Antarctic explorer Sir Ernest Shackleton at the only permanent exhibition devoted to Shackleton in existence. Highlights include an original sledge and harness from his Antarctic expeditions, a 15-foot model of Shackleton’s ship Endurance, an exhibition of unique Shackleton family photographs and an audiovisual display featuring Frank Hurley’s original film footage of the Endurance expedition. Footage of the 1903 Gordon Bennett motor race, one of the first car races in the world, is also on display at the Athy Heritage Centre and Museum. Other exhibitions cover topics like World War One, the Grand Canal, historical Norman settlements in the area and the effects of the Great Famine and the Irish Rebellion of 1798. The centre also acts as a tourist information office, internet access point and gift shop. اختر من بين مجموعة رائعة من خطوط الطيران والوجهات للسفر إلى أيرلندا. هل يمكننا مساعدتك في أي شيء آخر؟ تعرَّف كيف يمكنك التواصل عبر البريد الإلكتروني وفيسبوك والمزيد غير ذلك. لمزيد من المعلومات حول السياحة والإقامة ومناطق الجذب السياحي، يمكنك الاطلاع على كتيباتنا وخرائطنا. ‏التصنيفات مقدمة من TripAdvisor. ‏تعرَّف على ما يقوله المسافرون الآخرون حول أيرلندا و فنادق أيرلندا في TripAdvisor.